So you may remember my post for Tarragon Chicken, that I found in a Williams Sonoma catalogue, years ago. 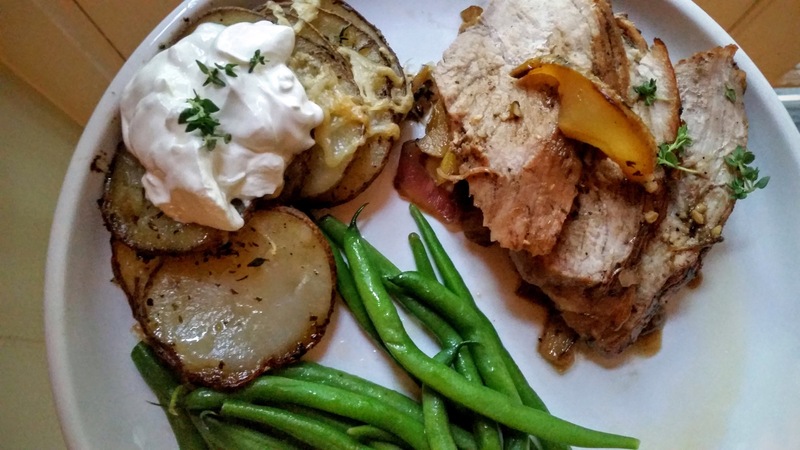 Sometimes, they have some killer recipes and this glazed pork with pears and thyme is no exception. 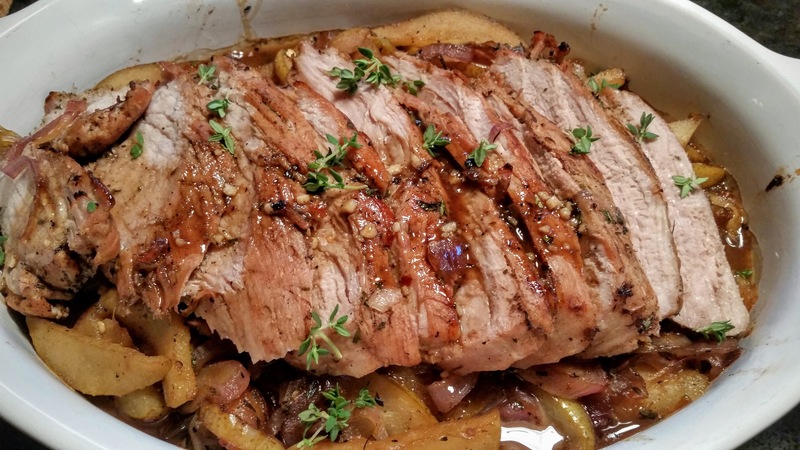 It needed a tiny bit of tweaking but Stevo declared it the best pork to ever come outof this kitchen…..correction, his grill. Simple fresh ingredients like, pears, thyme, red onion, a good quality balsamic vinegar and honey, were transformed into a sweet, rich, healthy meal. Stevo had a hankering to grill so although the recipe called for searing on the stove and then going into an oven, we decided to improvise. I needed the juices from the pork to help with the sauce so I decided to break out the cast iron pan. We preheated the pan for about 20 minutes, on the grill. 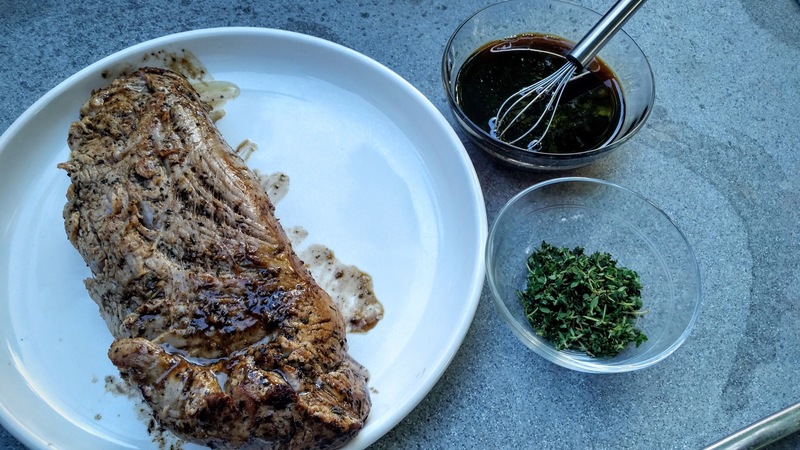 Over direct heat, we added olive oil to the pan and seared the tenderloin. 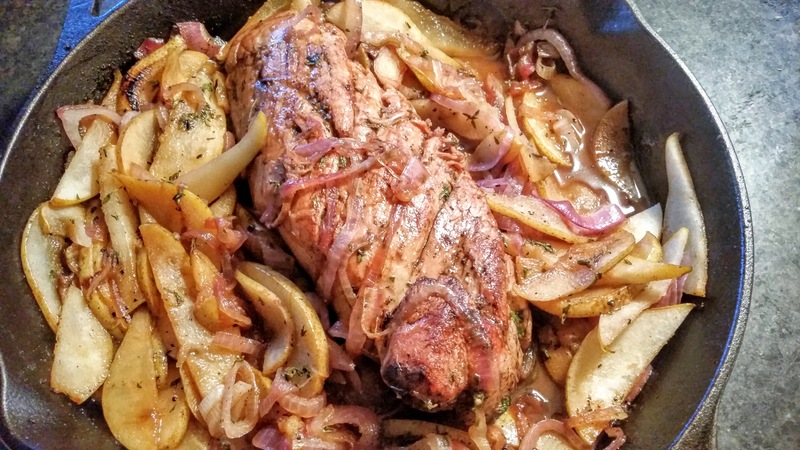 We then put the pork off to the side as it was time to sauté the onions and pears. After about 5-8 minutes, it was time to return the pork and cover it with the honey balsamic vinegar glaze. Next, we added the thyme, moved the pan to the other side of the grill (indirect heat) and let it cook for another 20 minutes. 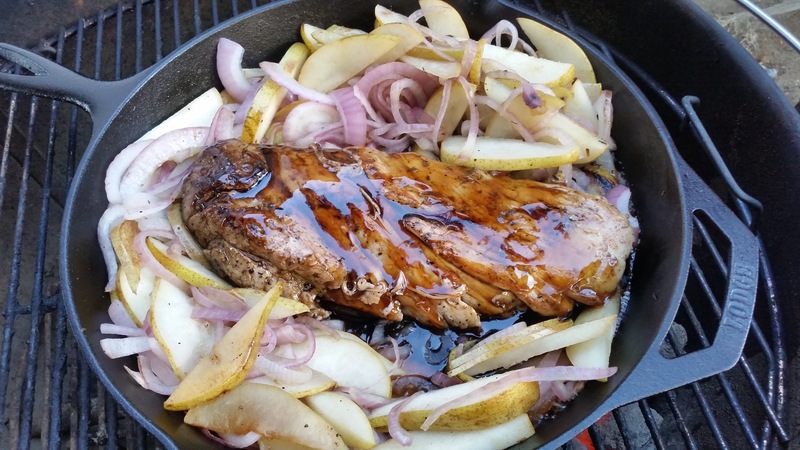 Once the internal temp reached 160, I tented the pork, removed the pears and onions from the pan and kept them warm in a 200* oven. 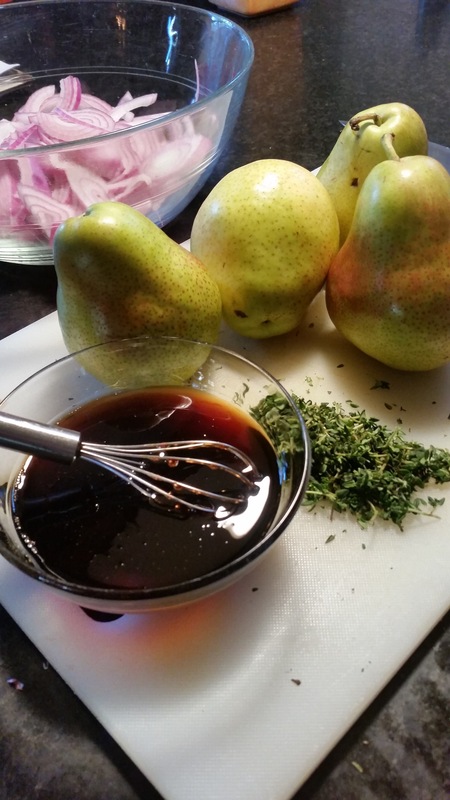 It was time to thicken up the sauce by slightly reducing it on the stove top and adding a few other essential ingredients, like garlic and salt to counter the sweetness of the pears. Ok, and I also added some red hot pepper flakes, as well……I couldn’t help myself. I added some more fresh time before serving. So here’s the original recipe and to it, I added salt, garlic and red hot pepper flakes. We also grilled it versus using the oven. Last, and what I think is the most important part of the changes we made, is to triple the honey and balsamic vinegar. There’s no way you’d have enough of that delicious sauce if you followed the quantities in the recipe. Season the pork tenderloin well with salt and pepper. In an ovenproof sauté pan over medium-high heat, warm the olive oil until shimmering. Sear the pork, turning occasionally, until well browned, 6 to 8 minutes total. Transfer to a plate. 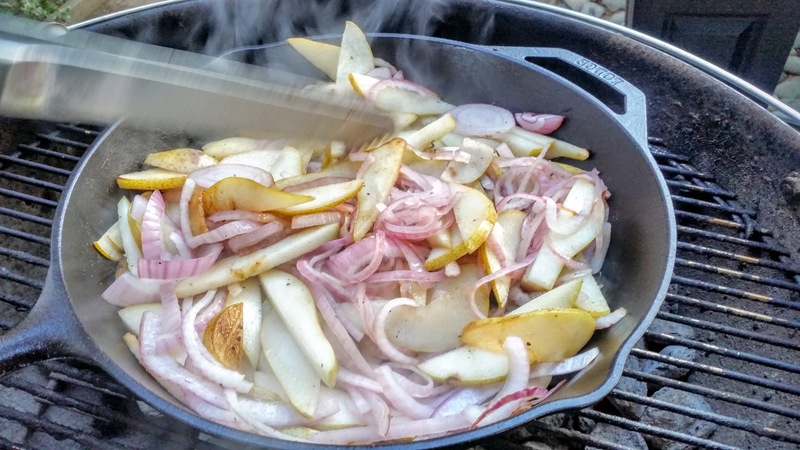 Add the onion and pears to the pan and sauté for 1 minute. 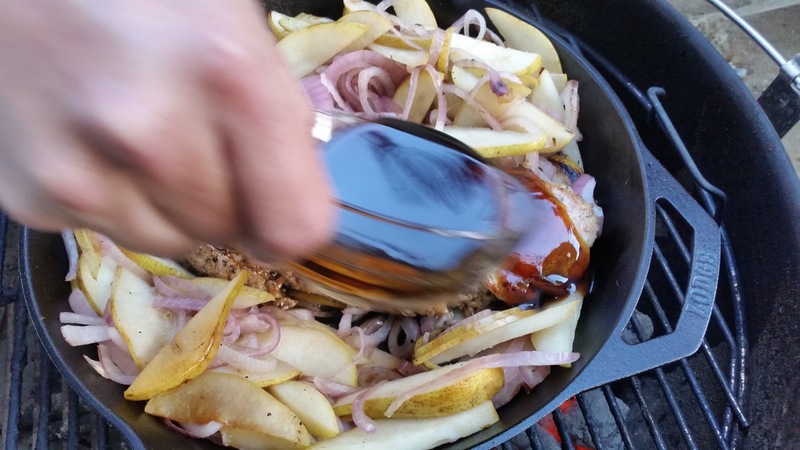 Return the pork to the pan and drizzle with the honey and vinegar. Scatter the thyme leaves in the pan. Transfer to the oven and roast until the juices run clear when the pork is pierced with a knife, 15 to 20 minutes. Transfer the pork to a cutting board, cover loosely with aluminum foil and let rest for 5 minutes. Cut into slices 1/2 inch thick. Add salt, garlic and red pepper flakes to the glaze. 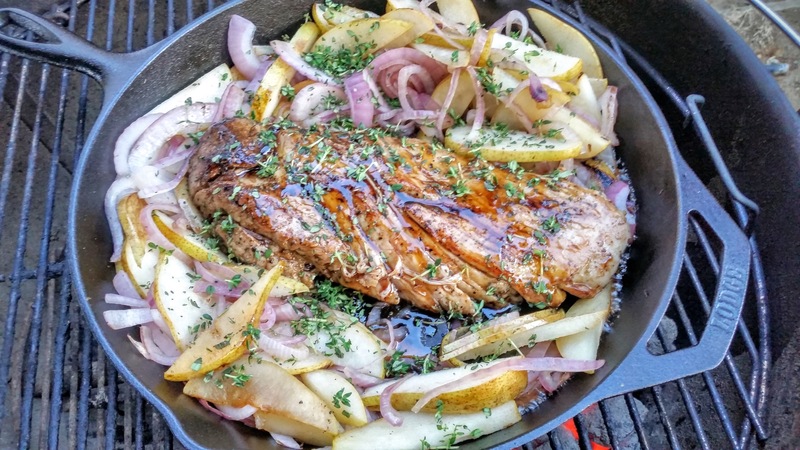 Divide the pork, pears and onion wedges among 4 individual plates, drizzle with the glaze from the pan and serve immediately. Serves 4. Adapted from Williams-Sonoma Cooking for Friends, by Alison Attenborough and Jamie Kimm (Oxmoor House, 2008).